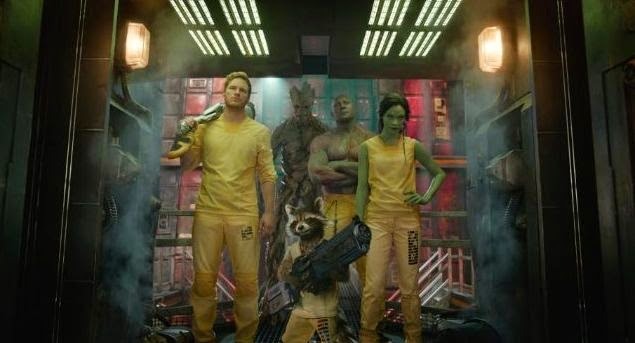 Rollicking, breakneck space adventure, big, impactful emotional moments, ribald jokes galore, and a heartwarming core message of the importance of family and friendship are the prime reasons to blast off with Marvel's Guardians of the Galaxy, perhaps the riskiest venture yet from Marvel Studios. A risk that has paid off big time. Opening up the vastness of outer space in the Marvel Cinematic Universe, Guardians introduces us to world-annihilating alien cultures, long dead space gods, weapons of infinite destructive power, and more than one genetically modified talking animal. Earth's Mightest Heroes, the Avengers, are nowhere to be found out there in the final frontier. Instead, the galaxy's best hope are a ragtag bunch of assholes. The Galaxy doesn't know how lucky they are to have these assholes as their Guardians, but they - and we - happily learn soon enough. Amidst the edge of your seat, anything goes careening action and adventure, the most surprising and pleasing aspect of Guardians is how richly realized the main characters are. All of the Guardians are broken people (er, and a raccoon, and uh... a Groot...), each nursing trauma, guilt, or regret like raw, open wounds. Certainly nothing can prepare you for the sight of a talking raccoon crying and drunkenly forlorn over existentialism. Equally sweet and touching is the moment Drax pets the weeping Rocket, and Rocket's reaction to something that has never happened to him before. Drax mourns his family and craves vengeance. Gamora has a serious case of sibling rivalry and a profound urge to fight against the nefarious plans of Thanos and Ronan. Groot is as soulful and heroic as a bizarre plant thing that can only utter "I am Groot" can possibly be. Quill is hardly the space hero Luke Skywalker or even Han Solo are, but he is learning, and he wants to save the galaxy for the most logical of reasons: because he's one of the idiots who lives in the galaxy. The Guardians squabble and brawl with one another, but gradually learn to trust each other and see themselves as a misfit family, going even further than the Avengers did as a unit when they assembled to save the Earth. Guardians of the Galaxy is a spectacular triumph for Marvel, a crowd-pleasing, devil-may-care romp though the dangerous waters of Marvel outer space, full of traitors, tyrants, and that loveable talking tree. Five oddball characters borne from Marvel Comics most people have never heard of are now, delightfully, our beloved space heroes for the 21st century. The Guardians of the Galaxy are the bunch of assholes we want watching our backs as our friends and makeshift family. May they save the galaxy over and over in multiple sequels (and maybe in a team up with the Avengers - fingers crossed!) while rocking out to Star-Lord's awesome mix tapes.